In November 2014, Enova Illumination Director of Sales and Marketing Jim Nelson attended the 67th Annual Scientific Meeting of the Japanese Association for Thoracic Surgery in Fukuoka, Japan. While there, he was introduced to a number of Japanese surgeons who use Enova LED Surgical Headlights by Mr. Matsumura, the owner and president of Medical Pine, Enova’s exclusive distributor in Japan. One of these surgeons was Takaaki Suzuki, MD, who is a cardiovascular surgeon and a professor at Saitama Medical University International Medical Center. Since November, Shedding Light connected with Dr. Suzuki to learn more about his practice and how he uses his Enova surgical headlight. Dr. Suzuki: My surgical practice focuses on pediatric cardiac surgery and I help all ages of patients, from newborn infants to adults, who have congenital heart disease. I am also a professor of cardiovascular surgery and a director of the Department of Pediatric Cardiac Surgery at Saitama Medical University International Medical Center located in Saitama, Japan. Dr. Suzuki: I spent 25 years as an attending pediatric cardiac surgeon after a six-year general and cardiovascular surgery residency. I think our practice has changed and advanced not only by improvement of surgical technique but also by improvement of pre-operative intensive care for severely ill patients. A newborn baby with a complex cardiac anomaly usually gets worse immediately after birth if precise therapy is not initiated as soon as possible. Currently, however, prenatal diagnosis by fetal echocardiography has made surgical results of complex cardiac anomaly much better. We can now build the best tailored strategy of treatment before birth and operate on babies who are in a more stabilized condition. Shedding Light: What technology would you say has changed or advanced surgery? Dr. Suzuki: Cardiopulmonary bypass products and techniques have improved cardiac surgery outcomes for infants and neonates, as well as improved the survival rate of patients with complex congenital heart disease. I like the Enova XLT-125 because it is portable. For the past 20 years I used fiber optic headlights. Although a fiber optic headlight is bright, it tethers me to the power source and is a bother to bring to another room or another hospital. Besides, the brightness of the Enova XLT-125 is excellent in spite of its light weight. Dr. Suzuki: Operating on a newborn infant requires excellent surgical lighting. We explore and operate deep inside a very small-sized heart and surgical headlights are a must. Dr. Suzuki: I heard about Enova’s LED surgical headlights from Mr. Matsumura, the president of Medical Pine, which is a Japanese medical device company focused on cardiac surgery devices. That was soon after the AATS meeting which was held in Minneapolis last year. Dr. Suzuki: We use the Enova XLT-125 surgical headlight and have three to five cases a week. I always use the XLT-125 in every surgery. Dr. Suzuki: I like the Enova XLT-125 because it is portable. For the past 20 years I used fiber optic headlights. Although a fiber optic headlight is bright, it tethers me to the power source and is a bother to bring to another room or another hospital. Besides, the brightness of the Enova XLT-125 is excellent in spite of its light weight. 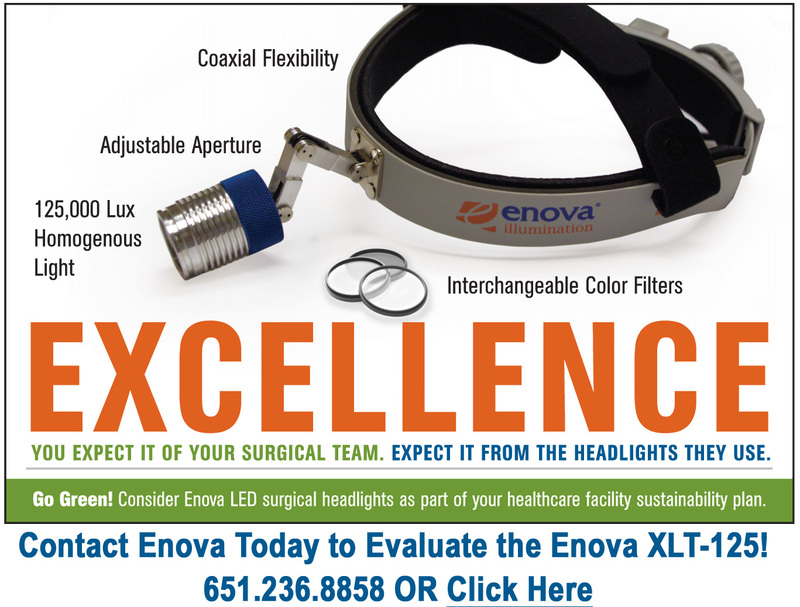 Shedding Light: Have you recommended Enova LED surgical headlights to your colleagues? How do they respond? 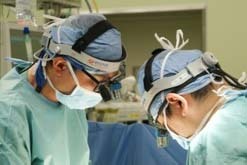 Dr. Suzuki: I recently recommended Enova’s XLT-125 LED surgical headlight to another attending surgeon in my department. No sooner had he seen my headlight, that he ordered his own Enova XLT-125.